If you are not yet an “Opted In” Member of StockReversals.com , sign up today to get our IPO, Swing Trade and Market Trend updates. At Stock Reversals Premium, we look for a combination of fundamentals and chart patterns, which when combined, our risks of losses are lower and our chances of success are higher. Highlighted originally on our 10/21 report and again on our 11/4 report, Spirit had relative strength vs. the SP 500 and ultimately gapped up for a +27% increase from our initial highlight. Noticed the pullback consolidation to the 34 ema, and alerted on 11/26 weekend report. Stock rallied +11% the week after. 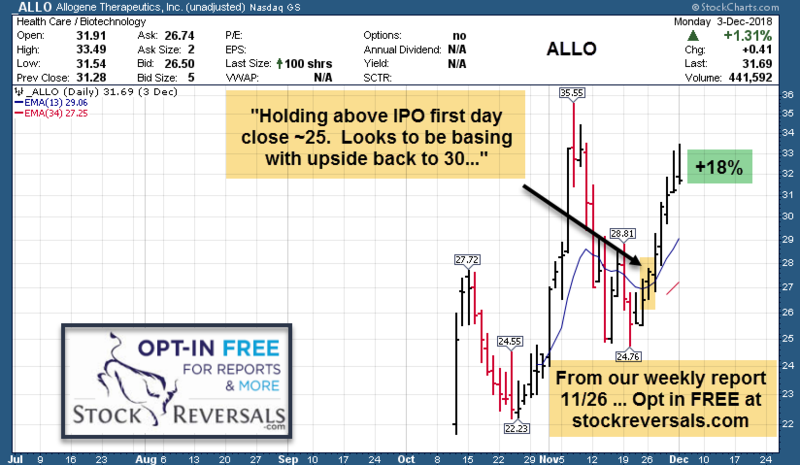 Post IPO pattern saw consolidation back to IPO weekly closing level. 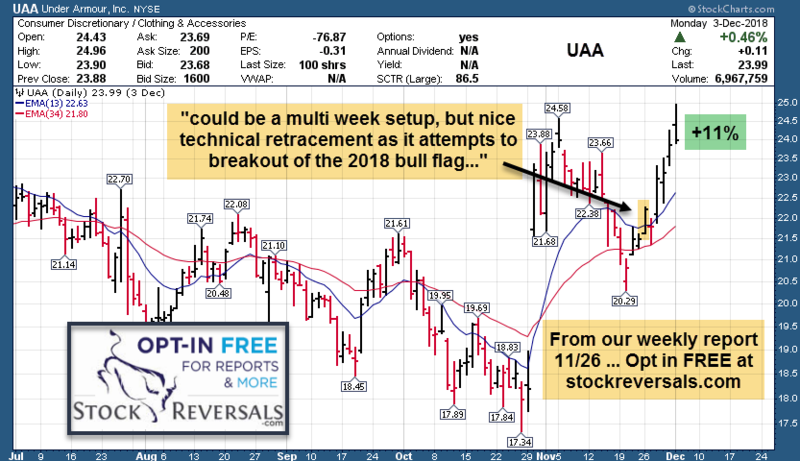 Highlighted on 11/26 weekend report, and the stock rallied +18% the week after. Sector leader, with price back to the 34dma and in a consolidation off 3 week upthrust. 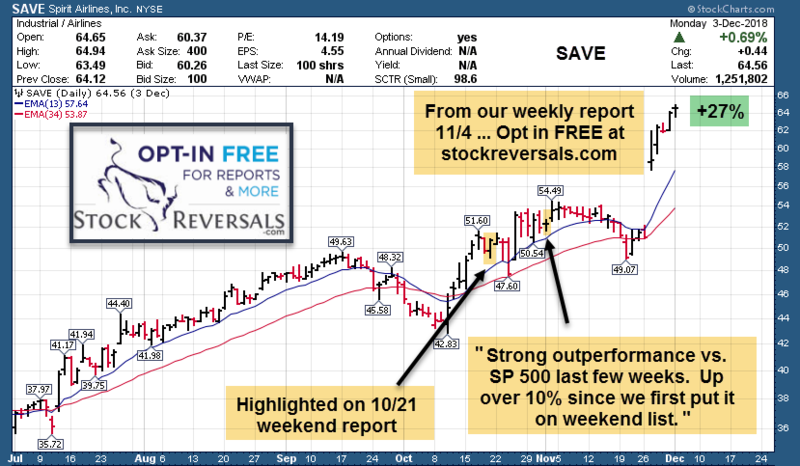 Highlighted on 11/26 weekend report, and the stock rallied +15% the week after. Classic W Pattern base with the 13/34 dma crossover to help. 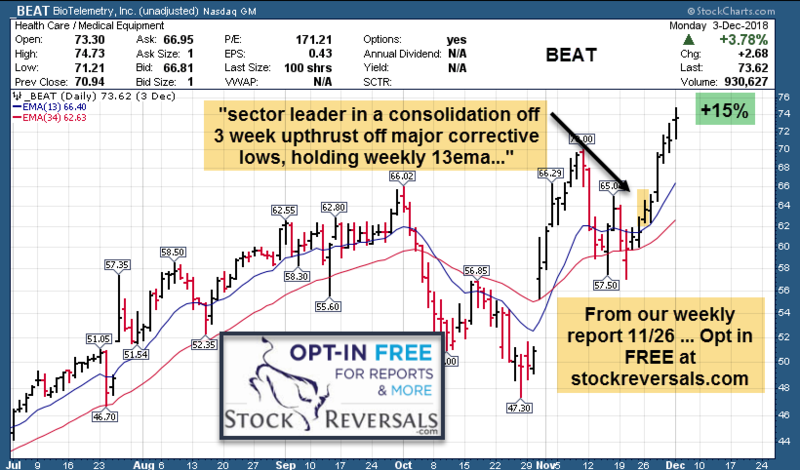 Highlighted on 11/26 weekend report, and the stock rallied +19% the week after. 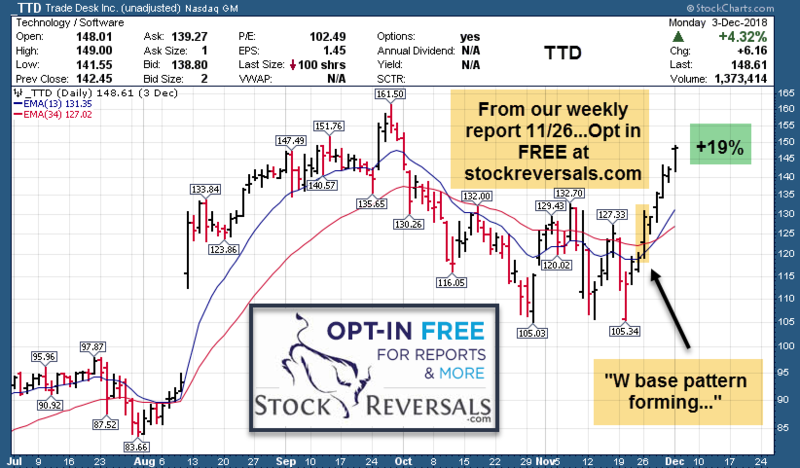 We will continue to find 10-15 quality stock setups in our always free weekly report, BUT if you want a market beating swing trade alerts service to assist you with your trading, consider signing up for our Premium Service <– (Click Link to learn more) with a 70% success rate since September 2013 inception! At our Stock Reversals Premium Swing Trade service we send an SMS text, E-mail, and SRP Members-only Blog Post with details on the company, entry and exit advice, stop loss parameters, plus SMS text and E-mail alerts to sell, morning reports every day covering all positions pre-market, ongoing strategy and trading advice, market forecast models updated daily, and 24/5 access to our Chief Strategist. Makes membership options now $69 monthly, $149 quarterly, or $524 annually! Enter Coupon Code in Checkout area in Coupon Field.